and my YouTube channel for updates on our adventures with the mountain dulcimer. 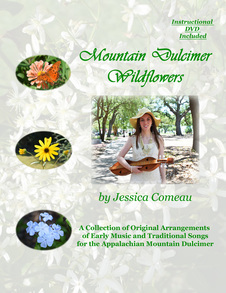 Simplicity, warmth, authenticity... these are among the musical values that the mountain dulcimer embodies. The mountain dulcimer is a uniquely American instrument that lends itself well to acoustic genres including folk music, traditional hymns, and international/world music. It is a bridge between the Old World and the New, the ancient and the modern, and my musical repertoire (both instrumental and vocal) reflects such fusions. My dulcimers are heralds of quiet joy, healing, and life well lived. They are especially suited to small, intimate gatherings and events, but they may also be effectively accommodated in larger venues. I would be happy to musically accompany a special occasion in your life, to share the essence of the music that I love with others in a performance setting, or to teach a group about the mountain dulcimer and how it can be a fertile source of personal enrichment. The above pages will explain and demonstrate my approach to each of these dulcimer outreaches and provide you with further information so we can explore how my music and instruction may fit into your vision.